Those of you who like jotting dates down on calendars may well be wondering where World to the West is. The new game from the team behind the excellent Teslagrad was supposed to launch on Wii U today, but it's nowhere to be seen - and with good reason. Rain Games has announced that the Wii U version has been delayed to an unspecified date. This might set alarm bells ringing given how many Wii U games have been quietly canned over the past year, but the developers insist that the holdup is down to the fact that they've found ways to improve the overall experience - so in this case, the delay should result in a better final product. If you're still holding out for World to the West on your beloved Wii U, let us know your thoughts on this delay by posting a comment. "Found new ways to improve overall experience"
To stay focused though, it looks like a nice little game to unload some hours on. Inb4 it gets cancelled​ and will be on the Switch instead. It's alright, we know it's still coming to the Wii U thankfully. I didn't realise this was a Zelda type adventure.It's received some average to good reviews,a decent but flawed game that has a lot going for it but falls short in many areas. Not really interested in this myself,I didn't enjoy Teslagrad and I've no interest in playing a Zelda type adventure that's not as good as the real thing. @MrGamerClock64 It won't be canceled. It has to be too far along for canceling and saving on development to make more sense than finishing and selling a few copies. This news is kind of late, actually. They announced this a week or two ago. A shame, but oh well. I've been super excited for this since it was announced, as Teslagrad is a wonderful little game. I must admit at this point I'd much rather get it on Switch, though. @OorWullie You didn't like Teslagrad!?! I think that game is amazing. Also the reviews i've seen, only a few from Youtubers admittedly, were rather positive and in the 8/10 range and the metacritic scores seem to average a solid 7/10. That means it's a really good to excellent game. A 9 is an all time classic and a 10 is a masterpiece. @Kevlar44 I found Teslagrad quite good to start with but it just didn't hold me for long.The first part I got stuck at,I gave up and had no desire to go back to it.I find that happens to me with many indie games.I had been really looking forward to it too.Maybe if I was to play it again I'd enjoy it more. 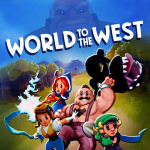 The first review I came across for World to the West gave it a 5/10.Gamereactor was the website which admittedly I have never heard of before but their criticisms of the game are the kind of things that would annoy me,exporation and combat seems like a chore.IGN Italia and Destructoid gave it a 6 and 7 respectively but they're kind of saying the same thing. Just wonder, why some Indie games are easily get physical release on ps4/xbox1 but almost always digital download only for Wii U / Switch ? That's much like sabotaging Nintendo image (Nintendo always treated like Secondary things while ps/xbox like Primary) and i'm tired with those unfair treatment. It didn't look that great when I saw it on the PSN store earlier, but then I thought the same for Teslagrad and enjoyed that quite a bit. Not too interested in the Wii U version as have made the Switch, but am ready to be pleasantly surprised again. Plus the old girl still getting support is awesome to see. @Anti-Matter Isn't the cool thing to do is to snub Nintendo? Seriously though it sounds like it is more difficult to get access to creating and releasing a Switch cart (judging by the Wonderboy case). And this fake switch tax devs are trying to leverage. Wii U could be due to Wii U barely ever having any retail space in stores? There is a ton of great games on the eshop I would of had no hesitation getting physically. Stop wasting time, port it to Switch instead. I bet the Wii u version is just cancelled! I've been waiting for this one but honestly at this point rather play it on the Switch. @Anti-Matter A physical release is expensive. The price for the consumer is often the same, but the publisher has to pay for manufacturing, shipping and storage. That's okay if we're talking about big games that are going to sell millions of copies anyway, but it's very expensive for indie games, especially for games with a low production run (as it's cheaper to produce in bulk). As it is now, the PS4 and Xbox One use Blu-rays, they're inexpensive to manufacture. Producing a game for PS4 isn't that different from producing a game for the Xbox One. We're looking at a potential 90 million userbase here. The Switch doesn't have that userbase yet, and since it requires a completely different type of medium (proprietary game cards), it may be not worth the costs to produce a physical Switch release. Even the Wii U used proprietary discs. And those are often a little bit more expensive to manufacture. Getting a Blu-ray printed isn't that difficult, manufacturing a Switch game card is a bit more complicated. More like delayed to apply some Switch and polish, amirite? Anyway "spit and polish" immediately brought Vanellope Von Schweetz to mind. If you've never seen Wreck-It Ralph, you just kind of owe it to yourself to do so. @MrGamerClock64 i wouldn't rule out a switch version at all, but the wii u version will definitely not be cancelled-it's basically 98% done. it's just some changes to how we're rendering the lighting, level shading and sfx into a single pass rather than separate render passes, which gets rid of framerate issues in a few of the busier areas. by our estimates fixes will take about 2 weeks(give or take, you can never be 100% sure with these things) followed by nintendo's internal approval process, which can take 2-4 weeks depending on a few factors. @XenoShaun switch carts are far more expensive to produce than discs and most stores still want the same share of the profits as in other units, so most of the costs aren't "fake switch taxes", just narrow margins that can't be cut much further. this is gonna sound weird, but developers actually already earn less on physical releases than digital units despite the price being higher, due to the costs of transport, manifacturing and sharing the profits between more parties! I still hope it comes to Wii U! With me not planning on getting a Switch any time soon (I will eventually) I really want to play this. I'm really enjoying my time with Wii U and 3DS. I'd be interested in ANYTHING awesome left for Wii U. @BezBot Same here, want on Switch. I'm willing to eat crow if I'm wrong, but I think it's cancelled. Why would they release a physical copy for a console that is dead, and has been confirmed dead by its manufacturer since last year? It doesn't make sense from the business perspective. it's not canceled, i'm the art director. we just want to release a stable version rather than a slightly shabby version. Its coming out the same day "Chromophore: Two Brothers" is released on the Wii U.